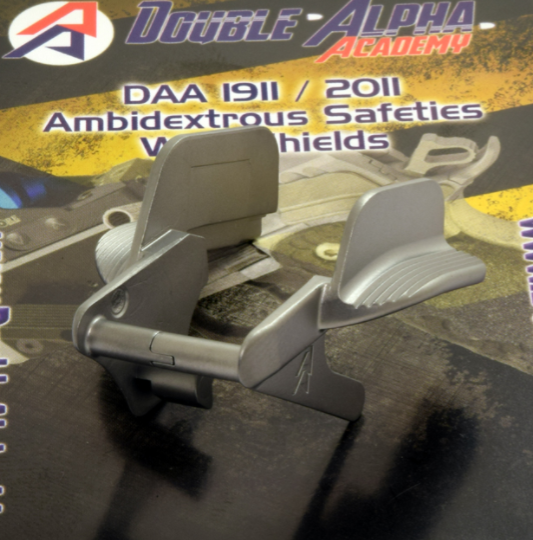 The DAA 1911/2011 Ambidextrous Safeties with Shields are precision-made stainless-steel Safeties made with state-of-art Metal Injection Molding (MIM) technology. They are designed for use on any 2011 or 1911 pistol, with some minor fitting required. It is always recommended to have a competent Gun Smith fit safeties! These safeties are designed to offer a wider and longer than standard paddle on left side of the pistol (right-hand thumb), with a smaller, yet still sizeable paddle on the right side, for those left-handed stages we all love so much! The total side to side width of the assembled Safeties are designed to be just narrow enough to fit the requirements of the IPSC Standard Division Box. The extended Safety paddle on the left side rests on top of the plunger tube, preventing excessive pressure and strain on the pin. The shields are well spaced away from the slide to avoid any contact or rub marks, which are common with other shielded Safeties. The large shields on both sides, ensure that you will not make contact with the slide, a known cause of malfunctions, especially in the heat of competition, when one’s grip tends to shift and sometimes tighten. (if you find yourself suffering from more malfunctions in matches than you have in practice – slide contact may well be the culprit).